The “Women for Trump” bus tour made a stop at the Trump-Pence headquarters in West Tampa late Friday afternoon. “Did anyone hear that the FBI just reopened an investigation?” asked Lara Trump, the daughter-in-law of Donald Trump and wife of Trump’s son, Eric. The crowd erupted in cheers upon hearing that statement, which came about three hours after the news first broke that FBI Director James Comey had written to congressional leaders, saying it is again probing emails that might be related to Hillary Clinton’s private server, reopening a potentially damaging controversy for Clinton just 11 days before Election Day. Joining Lara Trump was Omarosa Manigault, the breakout star of the first season of Trump’s NBC reality series “The Apprentice,” who was hired in July as the director of African-American outreach for the Trump campaign. She opted not to speak to the crowd, instead chatting briefly with people and taking a slew of selfies. The other speakers were Lynnette Hardaway and Rochelle Richardson, better known by their stage name Diamond and Silk, the YouTube stars who championed Trump early on in the primary season. Needless to say, the crowd erupted in cheers to that statement as well. Lara Trump said her father-in-law would bring respect back to the country and the White House. She then mentioned President Obama‘s recent trip to China, where authorities failed to initially provide a staircase when he landed. One “Woman for Trump” who was slated to appear but did not was national spokesperson Katrina Pierson. All told, the event lasted all of 15 minutes or so, after commencing an hour after the scheduled 3 p.m. start. During the hour interregnum, the presence of liberal activist Kelly Benjamin appeared to unnerve officials, including a security guard who several times asked Benjamin to leave the premises, claiming it was a private event and that he was trespassing. Each time he successfully talked his way into staying, before two Tampa Police Department officers were called in. They ended up walking him out to the front of the sidewalk of the event. 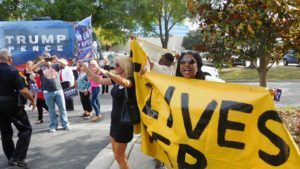 Then, as the women were just about to reboard the bus, Benjamin and two members of Black Lives Matter unfurled a Black Lives Matter flag, and for a minute or so it became tense, as the Trump supporters started shouting back “all lives matter” to the two activists chants of “black lives matter.” And then it ended.